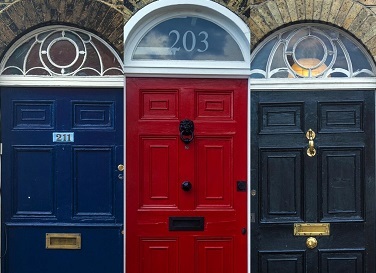 UK property tax: how are you affected? We first published this article in 2014, focusing on how best to buy and hold UK investment property in 2015. Here's the updated version for 2017...if you have any questions, please talk to us and we'll do all we can to help. You might also be interested in our latest property post - it's about UK property market predicitons for 2017. Are you thinking about buying UK property in 2017? You have to pay Stamp Duty Land Tax (SDLT) if you buy a British property costing more than £125,000 (£40,000 for additional homes). And since the 1st April 2016, anyone purchasing an additional home - including buy to let investment properties - has to pay an extra 3% surcharge on top of each stamp duty band. Land and Buildings Transaction Tax (LBTT) has replaced Stamp Duty in Scotland. LBTT rates also attract this 3% surcharge for second homes since 1st April 2016. With UK taxes taking an increasing chunk out of the profits of UK property investors, let's look at the key taxes, and how you may want to buy and hold property in 2017. Owners of rented properties are subject to income tax at the top rate of 45% once their UK-sourced income reaches £150,000 per annum. The lower tax threshold rates for 2017/18 are 40% and 20%. Most UK income tax payers receive a personal allowance - it's £11,000 for the tax year ending in 2017, and rises to £11,500 thereafter. This allows you to receive this amount of UK income before tax. The UK Government decided not to implement its proposed change of removing the personal allowance for non-residents thankfully. If the proposed changes had gone ahead, it would have meant non-resident individuals losing their income tax-free personal allowance. You don't normally pay CGT on the sale of your primary residence. But if you hold other property assets you'll either pay 28% capital gains tax on taxable gains if you're a higher rate tax payer, or 18% or 28% if you're a lower rate tax payer. See HMRC's website for more details of how to calculate any gain and the tax due on it. IHT is potentially applicable to all UK situated assets at 40%, unless appropriate tax structuring is put in place. For example, £10m of UK property held in a personal name would be subjected to up to £4m of UK Inheritance Tax upon the death of the owner. But which route should you take? Individuals purchasing UK residential property have a number of solutions open to them in order to mitigate, defer or remove some of the UK taxes that apply. With UK mortgage rates currently in the UK at 300 year lows, holding debt against property has proved very popular since the financial crisis led to artificially low interest rates in the UK. Debt can also be used to create a more efficient income from the property because when structured correctly, income tax can be offset against the cost of borrowing. Former Chancellor George Osborne unveiled a shock tax change in 2015 which will remove landlords’ ability to deduct the cost of their mortgage interest from their rental income when they calculate a profit on which to pay tax. The Chancellor wants to tax landlords on their turnover rather than profit, meaning that tax will be payable on non-existent income. For some, tax rates will exceed 100%: landlords will have to pay all of their profit in tax, and then pay more tax still. The tax increase will be phased in from this year, and fully implemented by 2020. In certain circumstances, any debt outstanding against a UK property upon an individual's death may also be deductible for IHT, making debt potentially an efficient way to hold UK property for non-UK domiciles. Tax advice must be taken in this respect. For high net worth individuals, offshore private banks will also arrange bespoke lending solutions, for example, against portfolios of investments, as well as property. The advantage of this route is that borrowing costs can be cheaper and higher amounts of borrowing can be achieved. For many years, UK properties have been held by non-domiciled individuals in offshore companies or Special Purpose Vehicles (SPVs) to protect from IHT, and also to add a layer of privacy. More recent legislation has meant that holding UK property like this has become much less attractive, although many non-domiciles still use this route - despite the potentially higher stamp duty costs in certain circumstances. Offshore trusts have often been used for succession planning in families, and continue to remain an attractive structure to hold UK residential property. They offer a high level of control, allowing a family to pass assets down to the next generation in a timely and controlled manner. Both offshore trusts and offshore companies can use debt to help structure their assets in a tax-efficient manner. If a property is held in a personal name, it is typically exposed to IHT, which is charged at 40% of the value of the property at the date of the death of the individual in question, subject to the allowances. Allowances, including the nil rate band of £325,000 per individual, are available to reduce this tax. 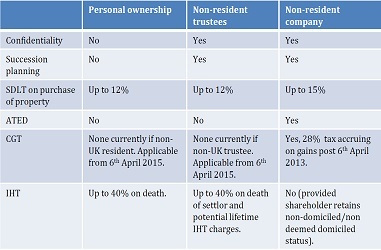 As the complexity and the tax cost of structuring property has increased in recent years, because of the changes in UK tax law affecting both domiciled and non-domiciled individuals, many are using high value insurance policies to provide a high amount of cash liquidity upon their death, to be made available to the beneficiaries of the UK property (or other UK situs assets) so that IHT can be paid. When structured correctly, insurance policies can prove very effective in paying the IHT due, and speeding up the process of probate so that the property can be released from probate. There is no such thing as the perfect, one-size-fits all solution for investors to buy and hold UK investment property assets. The best solution for you will depend on what you are buying the property for and what you want to achieve from the purchase. What is certain is that planning and structuring your property holdings is becoming increasingly important as the UK government seeks to squeeze more tax out of the housing market, which has proved such a solid asset class for investors to hold over the long term.